Public sector bank employees will go on a nation-wide strike on September 7 to protest the issue of new bank licences to private sector banks. 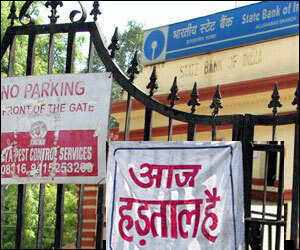 “Around 10 lakh bank employee from 27 public sector banks, 18 foreign banks, 26 private, 82 regional rural banks and 1,721 co-operative banks would be participating in this strike,” All India Bank Employees Association’s (AIBEA) General Secretary Vishwas Utagi said. The bankers are also demanding an increase in the number of public sector branches through expansion from the existing 40,000 to 1 lakh. Besides state-owned bankers, nearly 44 crore employees, including those from organised and unorganised sectors and industries would be participating in the strike, he said. “When the RBI is talking about financial inclusion, there is a need to increase the number of branches of public sector banks. We want the number to go up from 40,000 to 1 lakh, if the financial model has to become a success,” he added. The bankmen would also be protesting against the RBI’s proposal of issuing additional banking licences to private sector banks. “Employment, which a major concern for the employees, is also on our priority list of demands from both Central as well as State Governments,” Utagi added. The AIBEA has also conveyed its decision to Union Finance Minister Pranab Mukherjee and the Indian Banks Association (IBA), Utagi said. AIBEA claims representation of around 9 lakh bank employees across the sector. There are 27 PSU banks, 18 private banks, 82 regional rural banks and 16 foreign banks in the country, besides around 2,100 co-operative banks.